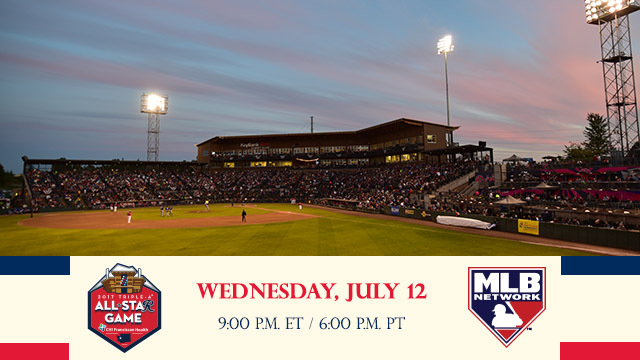 Triple-A Baseball announced today that the 30th annual Triple-A All-Star Game will be televised live on MLB Network on Wednesday, July 12. The announcing team of Paul Severino, Bill Ripken, Jim Callis and Michelle McMahon will bring the action to viewers nationwide beginning at 9 p.m. EDT. The game will also be available to MiLB.TV subscribers live online at MiLB.com via the MiLB First Pitch mobile app for supported devices. MLB Network's telecast will be available for live, authenticated streaming via MLB.com At Bat and MLBNetwork.com.The American Forces Network will showcase the event, bringing MLB Network's telecast of the Triple-A All-Star Game to the U.S. Armed Forces stationed outside the contiguous United States on U.S. military installations and aboard U.S. Navy ships at sea. In addition, the game call will be simulcast on MLB Network Radio on SiriusXM Channel 89. The 2017 CHI Franciscan Health Triple-A All-Star Game presented by Gildan will take place at Cheney Stadium, home of the Tacoma Rainiers. The game has been telecast nationally for most of its three-decade history, including every season since 1995. This will mark the eighth consecutive year the contest has aired on MLB Network. Returning for a sixth-straight year handling play-by-play duties on the telecast will be Paul Severino, who regularly hosts the Emmy Award-winning "MLB Tonight". For the past six years, Severino has provided play-by-play for Arizona Fall League game telecasts on MLB Network, including the Rising Stars Games and Championship Games. 12-year Major League infielder and Emmy Award-winning commentator Bill Ripken is back again to serve as an analyst for the Triple-A All-Star Game. Ripken's MLB playing career began with Baltimore in 1987 under the direction of his father, Cal Ripken, Sr., and alongside his brother Cal Ripken, Jr., marking the first and only time in Major League history that a father simultaneously managed two of his sons. In addition to the Orioles, Ripken also played for Texas, Cleveland, and Detroit. He is a veteran of over 200 games at the Triple-A level with Rochester, Buffalo, and Toledo. Ripken is currently a studio analyst for MLB Network programming, including his instruction-focused feature "Bill's Blackboard." Completing the returning three-person booth will be Jim Callis from MLB.com. Callis is a senior writer who contributes to the popular MLBPipeline.com with draft and prospect rankings, analysis, team prospect updates and the MLB Pipeline podcast available on iTunes. Michelle McMahon, a studio host and reporter for both MLB Network and NHL Network, will fill the role as field reporter. She previously covered college and high school baseball for FOX Sports North and Big Ten Network. The game will also be broadcast on the Triple-A All-Star Game Radio Network. Mike Curto, in his 19th season calling Tacoma Rainiers games, and Josh Maurer, in his fourth season broadcasting Pawtucket Red Sox contests, will have the call. Curto was also behind the mic for the 2006 Triple-A All-Star Game in Toledo. The University of California at Berkley graduate has filled in as an announcer on the Seattle Mariners Radio Network in 2011, 2012 and 2015. Maurer, who will be calling his first All-Star Game, has been the radio voice for the football and men's basketball teams at the University of Massachusetts since 2008. The University of Maryland alum made his MLB debut with the Boston Red Sox in July 2015, calling play-by-play on NESN for six games. Channel listings and more information on MLB Network can be found at the official website, MLBNetwork.com. First Pitch is the official app of Minor League Baseball. For more information, visit MiLB.com. The radio broadcast will be carried live on all 30 of the Triple-A flagship stations.